This week I watched the Mercury 13 documentary on Netflix. It is about the thirteen woman astronauts who trained for the space program in 1961. I tried to be inspired and not let myself be consumed with anger at the stories told in this documentary. It wasn’t easy. There were plenty of moments that moved me to tears, at how these brilliant, accomplished aviators and scientists were trivialized and relegated to lesser status for being women. They were put through more rigorous testing than the male astronauts, and scored better on some tests. These 13 women qualified, but were banned from the missions to space. Below is an excerpt from one of the woman astronauts’ testimony before Congress. 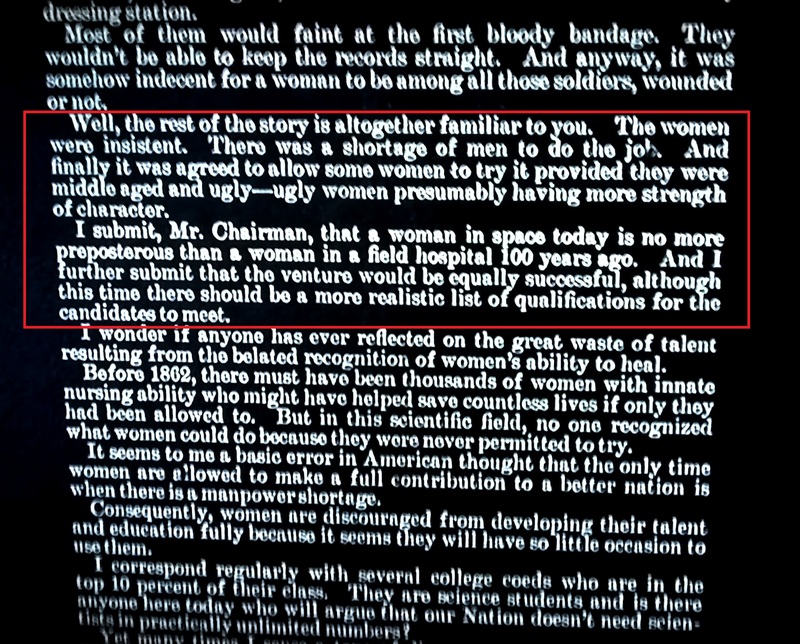 She used the exclusion of woman nurses from Civil War field hospitals as her example of why women should be allowed on space missions. < A free afternoon in Fort Worth–a treat for my inner cowgirl.